As part of our commitment to continuous professional development for our team, and to help with delivering the highest quality products and services to our clients, our project managers Jess and Christian attended the Deliver Conf conference in Manchester, dedicated to sharing ideas, techniques, tools and processes for better digital project management. With a broad range of speakers including from leading digital agencies, in-house teams including from the BBC and UK Sport, and creative industries service providers, this year’s talks covered engaging topics like; building effective teams and cultures; true project leadership; managing team and client expectations; and aiming high and wide. Attending for the 3rd year, Christian loved learning about new tools and processes which help especially in the early planning stages of a project, and getting to know clients and project teams quickly. Hyperisland is a great resource, providing simple and fun group energiser games, designed to make each other crack a smile. The games generate laughter and help groups build trust and openness through play, which leads to more effective workshops and breaking down some of the barriers which can prevent everybody from joining in. True collaboration gives a platform for everybody to communicate, which is critical in stakeholder workshops and group strategy sessions. We attended a workshop on impact mapping, a simple and effective technique that can be used for collaborative planning and helps to discover ways to make an impact. It can help to create better project plans and development roadmaps that ensure alignment of project delivery with business objectives. We already plan websites by putting the user first, and align business objectives to users needs, but this interesting technique provides a great way of finding different routes to achieving goals, which aren’t always apparent until you start collaborating and working through the process. You’re probably not going to be amazing all the time – which fits nicely with our pragmatic approach where we build in contingency from the beginning of every project and make our clients aware that it’s likely to experience a problem or two at some point throughout a project. We’re all human! Silence doesn’t mean understanding – which has been a key driver to changing our processes so that we always go through a new specification face to face, instead of emailing and assuming understanding if no questions get asked. Also a really important learning for any meeting, don’t assume if questions are not asked that everybody does understand. Quick failure is critical – this enforces our strategy of focusing on high-risk areas of a project first, so for example starting a data integration before the design process, or seeking signoff of a single page layout before you starting concepts or designs for a second. The vastly experienced US-based PM and author Meghan Mclnerny delivered an inspiration talk titled “Level up: a leadership MVP”, and covered some really interesting subjects which have influenced change back in the office already, including about becoming information radiators to build trust and authority amongst your project teams, and offering reminders about the importance of 1% marginal gains, especially useful for under-pressure and time-poor clients. Most interestingly was the concept of ditching the term meetings where possible in favour of using the title workshop instead. Hopefully, you also agree that workshop instantly feels more fun and interactive, more conducive to encouraging positive communication, whereby a meeting can suggest a boring one-way monologue or worse, boring PowerPoint. 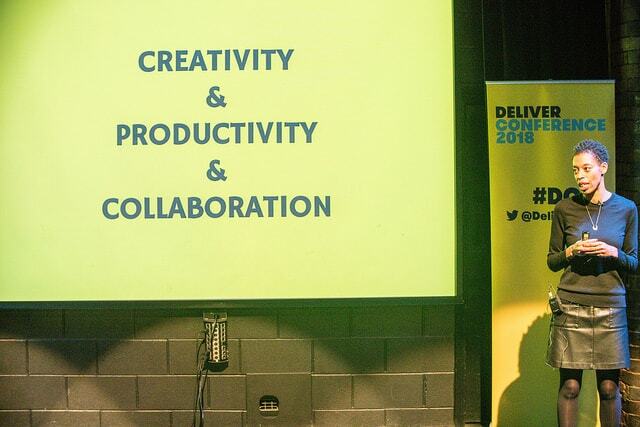 We look forward to another trip to Manchester for Deliver Conf 2019.